A Twist to a Classic Sandwich: Roast Beef with Cheese, Lettuce, and Tomato! Everything good about a roast beef sandwich can be a lot better with a little Rensauce kick! 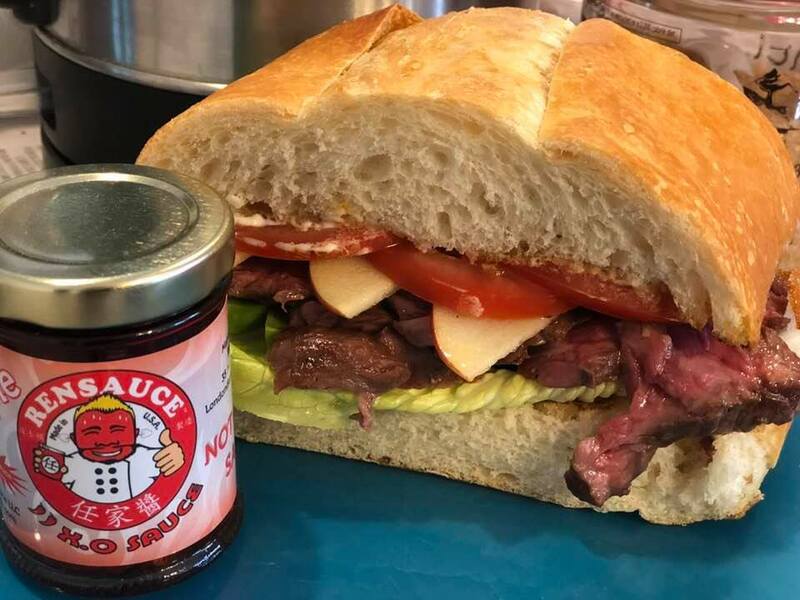 Add a nice touch of Rensauce to enrich the flavors of every bite and turn a good roast beef sandwich into an unforgettable experience! Feel free to email an idea, suggestion or question about how to use Rensauce directly to chef.ren@rensauce.com and he will answer you personally! Each batch of Rensauce is cook by hand, using only the finest ingredients and has NO preservatives. Chef Ren wants you to get the most out of his delicious sauce and would be happy to give you his own suggestions on how to use it. Email today! Pork and Rensauce: The Perfect Food Combo! Enjoy a perfectly grilled pork chop with a nice dollop of Rensauce. The gentle flavor of pork is a great place to explore the complex balance of flavor and spiciness of Rensauce. Applying your Rensauce to the still warm meat will release the delicious aroma...tempting your nose and setting your mouth up for excitement! A Chinatown favorite...Spicy Salty Pork Chops featuring Rensauce. Rensauce was used to make this popular dish in place of red pepper flakes. Not only does Rensauce supply the heat, it also adds multiple layers of flavors to liven up this old dish. Try it yourself! Pop a little Rensauce into your morning start me up to jump start your day. Dry rubbed with a simple mixture of salt, pepper & paprika. Cooked sous vide for 18 hours. Coated with Rensauce and finished in the broiler. Yum! Thank You, John Morton! We're happy that you're happy! Add flavor with a touch of fire to Pork & Ginger Udon Noodle Soup. Drop a teaspoon (or tablespoon) of Rensauce or Rensauce XO into your soup bowl. Your mild broth will turn into a tongue tantalizing delight. Order Rensauce online today! How do you like to use RenSauce Hot Sauce? Have you tried topping a cheeseburger with it? Turn the mundane into maginificent with Rensauce or Rensauce XO! This is great stuff. It has a crunchiness in addition to a wonderful tang with some heat...this is a winner. Copyright © 2017 — RenSauce • All rights reserved.